Summer is in full swing and we couldn’t be more thrilled to bask in the glorious sunshine. We imagine that your pup feels the same way, frolicking outside and finding just the right spot in the house to soak up the rays (given the AC is on, otherwise they’re in the basement/kitchen/laundry helping themselves to some tile floor). Just like we’ve been taught to hydrate and wear sunscreen, it’s important to keep your dog cool, too! While the obvious tricks work, like carrying a collapsible water bowl or having a doggie pool in the backyard, there are tons more fun and unique options to make sure Fido doesn’t get too overheated. Doggie approved ice cream is pretty easy to come by these days. You can make it yourself or buy it at the grocery or pet store (Nature’s Variety makes a good one, as does Nestle) or even find it sold at local restaurants and ice cream parlors. Starbucks also offers puppucinos for dogs! Is there anything cuter than watching a dog eat ice cream? (Fine. Peanut butter. I’ll give you that one). No pup is ever going to pass up a frozen peanut butter filled Kong. A peanut butter frozen anything, really. Buy a fun ice tray and freeze small treats or blueberries in water and serve those on a hot summer day. Grab some plain ice cubes and make a doggie smoothie. Ever heard of a chicken pop!? Mmmhmm. You get the idea! It’s easy to forget that while us humans can sleep in our regular bed throughout the year by simply changing our linens and switching on the AC, dogs can’t quite sweat it out like we can. The added warmth from lying on cotton is doing them no favors during the summer months. Luckily, there are tons of cooling dog beds and pads available if your pup seems to be restless at night or sequestering themselves to sleeping on the cool kitchen tile. Wrap a hose around a pole and use a bungee cord to hold it in place. Put it on the “mist” option and allow the cool spray into the backyard where you and your dog are hanging out. He’ll love laying beneath it or at least walking through it! If your dog sleeps in a crate (or hangs out in one during the day), it’s awesome to give them a little breeze with a crate fan. While it’s true that this is only a minor fix if they’re truly overheated (they’ll need access to water on their paws and to drink), it’s a nice way to give them a little relaxation while you’re away. 7. Build ’em a sandbox! Many dogs love to dig, and what’s better to dig in than sand? 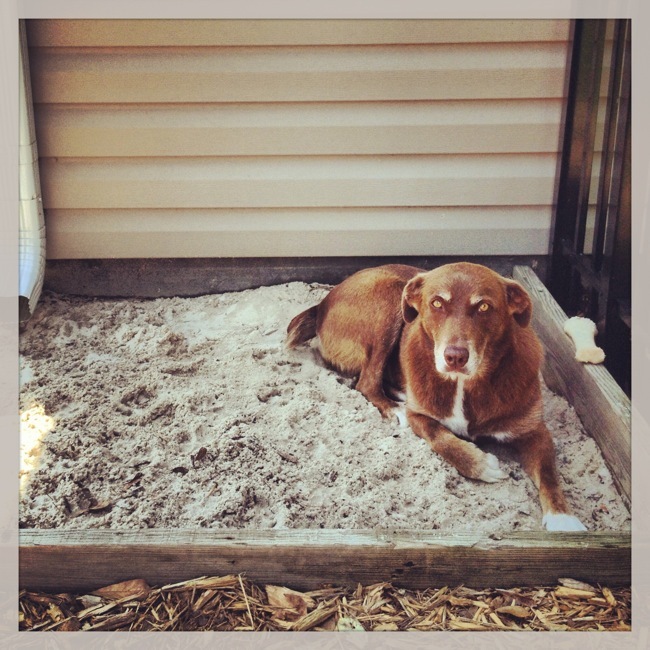 Wet sand stays cool for days, so if you have a spot in your yard to build a sandbox (in the shade is even better! ), head to Home Depot and get crafting. It’s likely cheaper and easier than you think, and your pups paws will thank you for it. If you’re headed out for a day at the beach or park, one way to keep your dog cool on the go is to affix him with a cooling vest or collar. He might look prepared for you to throw him overboard, but he’ll forgive the goofy gear once he realizes how cool it will keep him. Need something in a pinch? Wet a bandana, stick it in the freezer and tie it on your way out! (And then some water because beer is tasty and refreshing but probably not actually super hydrating). What tips do you have for keeping pups cool in the summer months? Share them in the comments below and together we’ll make summer the coolest season of them all.